Ever heard of "ozone therapy"? 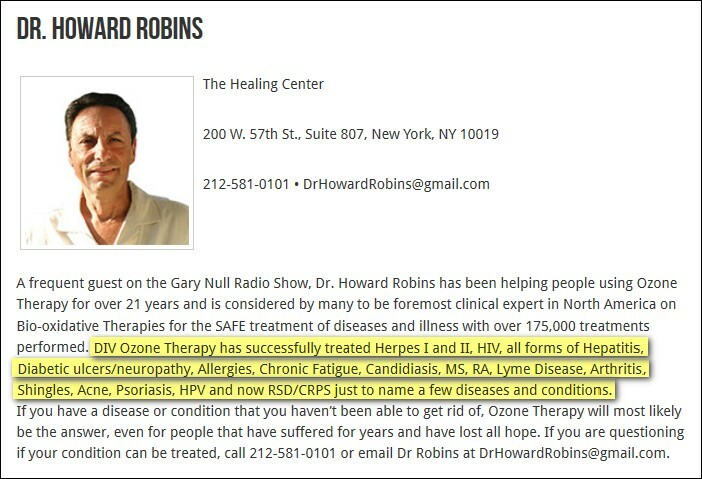 One of a number of unproven “therapies” offered at expensive cross-border clinics, ozone therapy involves infusing the blood, body cavities or drinking water with triatomic oxygen, in order to kill “HIV and cancer virons [and] arthritis microbes” [sic] while enriching the blood, according to one Web site. The Environmental Protection Agency considers ground-level ozone to be a pollutant that causes significant health risks. For other contrasting opinions about "ozone therapy," click here for a keyword search of "ozone" on the website of the American College for Advancement in Medicine ("The Voice of Integrative Medicine"). Click here for the same search on Quackwatch.com ("Your Guide to Quackery, Health Fraud, and Intelligent Decisions"). In an October 31 interview with conducted by Lynn Doyle via a NewsMaxTV program called Meet The Doctors, Robins discusses his recent trip to Sierra Leone to treat ebola patients with ozone therapy. According to the interview, the project was prematurely terminated by the Minister of Health, but not before he treated the country's president, Ernest Bai Koroma. Was President Koroma ill? I've asked for a statement from Cynthia Oremi Jarrett-Thorpe of Sierra Leone's consulate in Atlanta (near where I live). She e-mailed me that she's working on my request. Here's the NewsMax interview from which I transcribed and time-stamped some highlights. (:55) Robins: We got (to Sierra Leone) late at night, saw that all our cargo had come in with us with all our medical supplies and equipment. 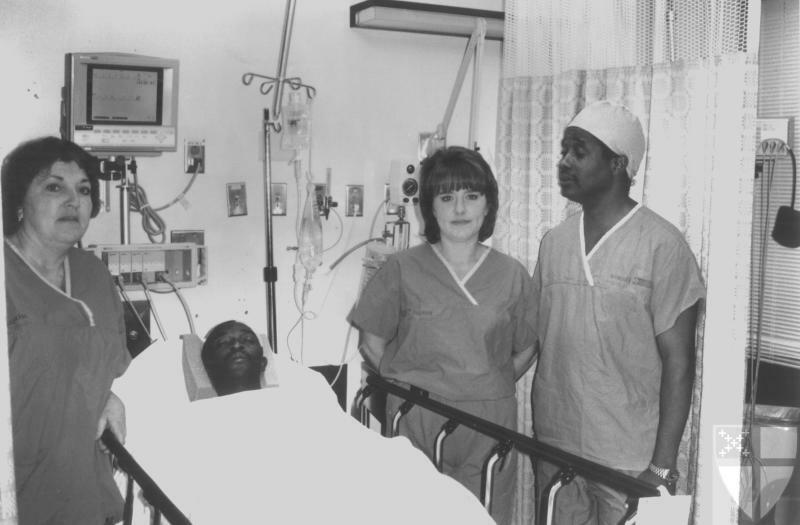 The next morning we went right over and trained about eighty to a hundred doctors and nurses who were gonna be on the front lines fighting this. Over the next three days we trained individual groups of these doctors to make sure they knew how to do this intravenous therapy well and we wound up with a handful who we thought were the best. (1:50) I went with Dr. Robert Rowen from Santa Rosa, California, and he also has been training doctors in ozone therapy, so the two of us were able to do this in a rather intense way. (2:15) The older what they call senior doctors there were very skeptical, so it took us about, just a few hours to win them over with the science of it and then when we went into the clinic and started doing it on them and treating them and having them treat each other, that was the finishing touch. They were just ready to go. Doyle: And you actually treated some of the highest members of the government of Sierra Leone. Robins: Well, you can't get higher than President Koroma. And after meeting with him, he invited us back to his home that evening and this is isn't just like a home, this is like getting into the White House. And we went back to his home, spent an hour and a half, and I personally got to treat President Koroma who actually trusted me to do this on him without any security around him and he saw the ease of it, the safety of it and immediately wanted us to get into the clinics to do this. Doyle: And yet you did not get into the clinics to do it. Robins: Well, this was an interesting and very unfortunate situation that happened. I left a week ago Wednesday night at midnight [presumably October 22] to come home. Dr. Rowen stayed two more days. We were finally getting in that Thursday morning. After meeting with the major who at this clinic there called Hastings, which is in Freetown, the capital of Sierra Leone, the major and all the healthcare workers were fighting over who's gonna get the therapy first so they would strengthen themselves against getting the virus themselves and a call comes through from the deputy assistant to the minister of health. And he says if they do this therapy on anyone there including the healthcare workers they're gonna lose their jobs. A few minutes later the minister of health calls and confirms this. So it never happened that day at the clinic. (5:25) Robins: The latest that just came in around this is that the doctor we were working with, Dr. Kojo Carew, refused to treat any of the ministers and their families who were now clamoring for the therapy. He was going to Liberia 'cause he knows the president of Liberia, to threat the people there. Robins: Well, what happened was, we get an e-mail from Monty Jones, the special adviser to the President Koroma, saying we'd like to renegotiate you coming back to Sierra Leone and doing the therapy in the clinics and that's the position we're in right now, so we think it may still survive and it may actually happen. According to Doctor to Test Ozone Therapy Against Ebola by Nick Tate, NewsMaxHealth, September 24, 2014, the Sierra Leone trip was conducted under the aegis of Rotary International. 11/29/14 UPDATE: Click here for the 2011-2013 IRS 990s for the West Hempstead, NY Rotary Foundation. 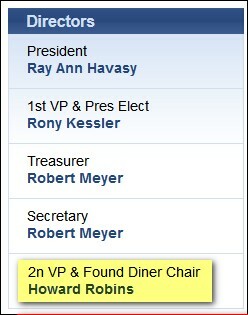 Dr. Robins is listed as vice president in 2011 and president in 2012. I have an e-mail in to Elizabeth Minelli who handles media relations at Rotary International's Evanston, IL headquarters and will report the results. What about the quarantining of members of the ozone treatment project when they returned to the U.S.? If another reporter doesn't beat me to it, I'll blog a follow-up item about that. UPDATE THIS AFTERNOON: I just came across this November 7 interview Alex Jones conducted with Robert Rowen MD about his trip to Sierra Leone. Dr. Rowen says he was under quarantine at the time of the interview. (4:50) Dr. Rowen says he was invited to come to Sierra Leone by the country's president and met with him twice. (6:30) He discusses being quarantined, but doesn't mention if any government agencies were involved. (13:00) Dr. Rowen says the Sierra Leone "foreign minister" wanted ozone treatment for his family. Was he referring to minister of foreign affairs Samura Matthew Wilson Kamara PhD or someone else? 11/26/14 UPDATE: I just came across this interview with Dr. Rowen conducted by Dave Asprey who per his website is the "founder of The Bulletproof Executive, is a Silicon Valley investor and technology entrepreneur who spent 15 years and over $300,000 to hack his own biology." The interview is undated, but apparently was conducted the first week of November. A complete transcription of the interview is posted on Mr. Asprey's website from which I pulled some quotes. Rowen: I’m on quarantine but I actually didn’t treat Ebola patients, myself. Asprey: What did you do? We went together and I was there for a week. He was there for 5 days. We taught. We even met with the President of Sierra Leone. By the way, this was on an invitation from the President of Sierra Leone. Rowen: President Koroma. We met twice with him. He actually received the treatment. We prepared talks and lectures before scores of people, especially their doctors. We met with some of their most prominent doctors. One of whom, the President of Sierra Leone Medical Dental Association walked in the door very skeptical...(When she left,) she just melted. She melted. Came in skeptical and melted, and to the point where she came in to receive her own ozone treatments. She did a treatment on me. I let her do one, so she would know how to do it. Everything was cool but the problem was, unbeknownst to us, there was some skullduggery and even though the President wanted this, and it appeared his Chief Advisor wanted it, there were some things happening behind the scenes in the Ministry of Health. ...Asprey: Tell me what the Minister of Health did there but that background is really important. Rowen: It’s what the Minister of Health didn’t do. Of all people who didn’t come to our lectures, the Minister of Health and his staff didn’t come. Don’t think this wasn’t deliberate. It was....We went through meeting, after meeting, after meeting and finally, on Wednesday, which was the last day that Howard was there, we got to the Ebola czar, Paolo Conte [sic] and it was like pulling teeth to get there. We got there about 4:30 in the afternoon and he listened to us. We said, “Do you have any questions for us?” We were there with a National hero, Kojo Carew, a physician, whose [sic] a National hero there. He saved a lot of lives during their wars, 10 years ago. He’s an icon. Paola Conte [sic] said to us, “Yes, I have one question. How come this isn’t being used already in the Center?” I mean, here’s the Ebola czar saying, “Why isn’t it being used?” We thought we had final clearance at last. Howard left that night. Next morning we started off in jubilation to the treatment center. Remember, I didn’t go there to treat Ebola myself. That would have raised great consternations [sic], straight up. I didn’t think I needed to do it. There’s plenty of people to do it. I wanted to teach this treatment. We get to the Ebola center and there’s a containment building that is far enough away that I thought, “Okay.” Then we go into their meeting area where there’s a lot of people, staff, doctors and nurses. This is not a contaminated area. No one is there in space suits. The doctors that we had trained previously during the week didn’t show up, so we’re ready to train new staff and new doctors, and they’ve got some skepticism but we explain it to them. I show them a You Tube video that I made on their doctors, that’s posted on You Tube. It’s called, Prozolone Comes to Sierra Leone. They saw it and their jaws dropped to the ground. They couldn’t believe the miracles they saw on people they knew. Dr. Rowen: Wow. That applied to everybody. He then got a follow up call from the Minister of Health, himself, reiterating it. Well, we had already started the process of treating people, doctors and nurses and they were vying for treatment. They were actually competing to get the treatment. They wanted it because they saw it as a means to protect themselves from getting Ebola themselves. Asprey: What evidence did they receive that ozone has any affect [sic] on Ebola...Can you walk people through the typical IV or rectal, or vaginal, or oral, or the different ways that people take ozone, and then talk about the one you’re using with Ebola? Rowen: The standard accepted method is called MAH, Major Auto Hemotherapy which I’ve done since 1986. I do a particularly effective form called hyperbaric ozone therapy where we take blood out, into a bottle, pump ozone in under pressure and then we deliver that back. Let me tell you, as far as MAH, that’s the cat’s meow. It is the best. I wouldn’t do it any other way. It is so swift, so efficient, so quick, and it’s effectiveness, in my opinion, is far, far better than other forms of MAH, Major Auto Hemotherapy. Howard Robbins [sic] pioneered a method that is probably as good. He thinks it actually might be better. That remains to be seen because it’s never been tested out. His method involves giving direct intravenous gaseous ozone. It’s not air, it’s gas, but I don’t your viewers to think that we’re shoving air into people. Air is Nitrogen, 80 percent nitrogen, which wouldn’t be too cool. Rowen: Yes. This is oxygen that has been metabolically active. Yes, you could be getting 30, 60, even more ccs of gas but it’s oxygen which is consumed by your body very, very, quickly Very quickly. He’s pioneered a really cool method of this that doesn’t involve taking blood out. When you’re dealing with Ebola, that’s way superior. It’s also dirt cheap because it only requires butterfly needle and syringe. Yes, there’s other methods. There’s rectal. You may be doing that yourself. Am I right? Rowen: I do rectal, at home, as well. It is very effective. ...Rowen: We got a call the following day after we were black balled at the (Sierra Leone) Ebola treatment center, the Foreign Minister wanted us to treat his mother who lived in an Ebola area, him and his family for prevention. First, please let me say that I (and Dr. Robins) felt very honored to have been requested by you to come to Sierra Leone to bring ozone for Ebola...You should know that in just three weeks of preparation, we received over 32,000 USD in private donations from ozone followers around the world to provide materials and shipping for your people. Some of your most prominent physicians requested treatment for pain with ozone, for which training Dr. Carew was given freely by me personally in addition to the protocol for Ebola. ...Mr. President. We felt even more honored that you met with us in the Statehouse and again at your personal residence. Our admiration for you went up many folds in that you requested to receive a treatment yourself. That you so trusted us so, and put yourself forward to experience it ahead of your People is a testament to your leadership. I commend Dr. Eva Roberts, who came to the lecture skeptical, and seeing the science, she turned over completely, requesting intravenous treatment herself, performing one on me, helping instruct the young doctors in their training and then getting knee treatment from me. On my sixth day we met with Major Palo Conteh, the Ebola chief. After we explained everything to him, he stated, “I have just one question. Why is this not being done as we speak here?” Dr. Robins and I thought we had cleared our last hurdle, getting his approval. The next day, I traveled to Hastings with Dr. Carew. While training doctors and nurses EAGER to get the treatment themselves for protection and to move ahead with patients, the Major in charge there got a call from the Assistant Minister of Health. She told him, “Your job will be in danger if you permit ozone therapy for anyone there.” Shortly after, a call came from the Minister of Health, who endorsed the order of the Assistant Minister. I could not believe what I heard, and, admittedly, I exploded in anger before all assembled there. Mr. President, the directive was not only to deny treatment for patients but also to the staff, risking their lives. ...I went directly to the National Television to tell the story. One, Mr. Stephen Ngaugah, was on Val’s show and went on and on about how the government is winning the Ebola war...He then went on to castigate me, an invited guest of His Excellency, to come and save lives with ozone. He told me I should stay in America to treat our Ebola patients here rather than “experiment on Africans like guinea pigs.” Mr. President. I will tell you I was very restrained and measured in my response to this horrible insult, directed not only to me, but also to you, the one who invited me. I believe his comment made you to look like a fool. ...Now the next morning at about 8:30 am, Dr. Carew got a call from the Foreign Minister. It seems he was worried about his mother up north in an Ebola area. He wanted prophylactic treatment for her and the whole family. ...At this time, your ministers will not get treatment with equipment paid for to prove ozone therapy for Ebola victims. I cannot blame Dr. Carew for now deciding to take the project to Liberia. I would do the same thing. (The) disrespect showed me, an invited guest of the President, by the NERC (National Ebola Recovery Commission) director on the televised show...I wanted to tell the director, Mr. Stephen Ngaugah (pronounced gouger) that I believed he was involved in Crimes Against Humanity. I was fearful if I did that there could be political repercussions and I’d be held responsible. So I stopped just short. However, I did put that term in the minds of everyone I met, and sent a departure letter to the President’s key advisor who arranged the invitation. I will post that email on this page. ...Dr. (Kojo) Carew was on national radio tonight, broadcast all through the country. He did use the term, and told his people that Ngaugh, the sinister man who accused me of coming to experiment on Africans, should be thrown in prison for CRIMSAGAINST [sic] HUMANITY. Actually, I learned a lot about this man today. He was a nothing living abroad who earned a living as a taxi driver. The ebola epidemic created financial opportunity for him. He muscled his way into the head position of NERC and demanded a 10,000 USD per month salary. Via Google I didn't locate a NERC director named "Stephen Ngaugah," however I did locate NERC Director Stephen Gaojia. This item has been updated and revised for clarity.